Plan of mosaics as discovered at the end of the 19th century by H. Lavagne, following the studies of H. Labande. 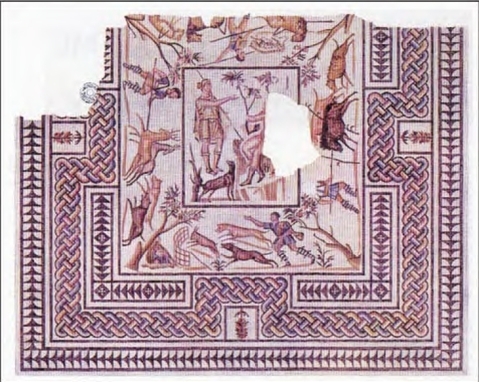 The archeological history of the Villa Laurus is identical to the history of the mosaics. It began in 1836 : while ploughing, a mosaic was hit and M Alquié, superintendant of the Marquis of Forbin, started the excavations. Four rooms with mosaics were discovered but were rapidly buried to protect them. During the winter of 1898, M Peyrusse the new owner, after deep ploughing, renewed the digging but fearing damage from freezing weather, buried them again. In 1899 work started again and a new mosaic was dicovered in room 4, a segment of which was given to the Vaucluse Academy, then to the Avignon Museum. It is a mosaic representing a water scene with fish and dolphins ( 11 ft x 10 ft). In the Spring of 1900, M Peyrusse finds three new mosaics which are thoroughly compiled and studied in 1903 by H de Villefosse, archeologist and L H Labande, curator of the Avignon Museum. The architect H Nodet makes beautiful water colored drawings of the mosaics which give us details of the iconography. - ROOM B mosaic with a Nile scene, partially destroyed. Egyptian peasants on the bank of the River Nile, scene well known in Italy and Africa but is found for the first time in Gaul ( name of France at the time). The theme is used under Hadrian (117-138 AC). - ROOM D : mosaic of Dares and Entello, almost entirely preserved. 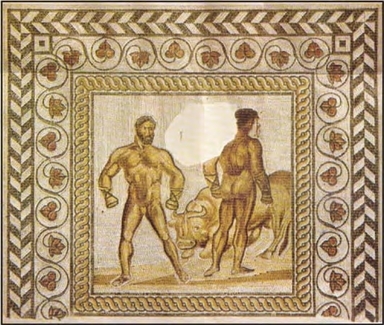 Fight between Dares and Entello, the only mosaic found in France, inspired by the Fifth Book of Eneid, Virgil. - ROOM E : representing Diana and Callisto in a hunting scene. It comes from Ovid’s Metamorphosis. M Peyrusse until 1913 will organize visits to the site. 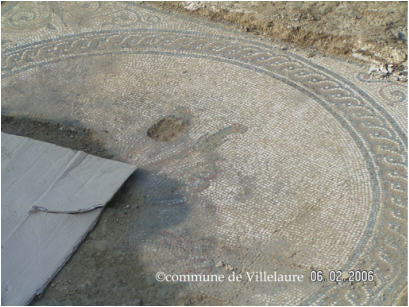 The 3 mosaics are then removed by an Italien expert and stored in the owner’s farm. In 1920 they are sold to an antic dealer in Avignon then in Paris. They are proposed to the Louvre Museum which does not want them. Then they are bought by an American dealer, J. Brummer of New York. They leave France in 1926 and Villelaure loses track of them. In the sixties, JC Rey a story teller and a writer from Villelaure, decides to find out where the mosaics are. With the help of J M Marsily from Pertuis and from H L Lavagne, the mosaic Dares and Entello is found in the the Getty Museum in California. As to the mosaic, room B and E, postcards are printed from the drawings of Nodet. In 1897 Rey got a message that Diana and Callisto was in the LACMA Museum in Los Angeles. In 2006, a fifth mosaic was discoved during new excavations by an INRAP team. The mosaic is still buried. The fifth mosaic renewed the interest in the Villa Laurus in Villelaure which had given such exceptional pièces of Roman art.